Born Pierre Jules Louis Laudenbach, he was encouraged by his uncle, actor Claude Garry, to pursue a career in theater and film. During the 1920s, Fresnay appeared in many popular stage productions, most notably in the title role of Marcel Pagnol’s Marius (1929), which ran for over 500 performances. His first great screen role was as Marius in the 1931 film adaptation of the play of the same name. He replayed the role in the next two parts of Marcel Pagnol's Marseilles Trilogy, Fanny (1932) and César (1936). He appeared in more than 60 films, eight of which were with Yvonne Printemps, with whom he lived since 1934. In that same year, he appeared in Alfred Hitchcock's first version of The Man Who Knew Too Much. 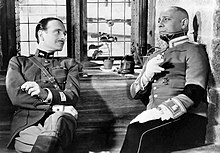 In 1937, he portrayed the aristocratic French military officer Captain de Boeldieu in Jean Renoir's masterpiece La Grande Illusion. In 1947, he played Vincent de Paul in Monsieur Vincent, for which he won the Volpi Cup for Best Actor at the Venice Film Festival. He also portrayed Nobel Peace Prize laureate Albert Schweitzer in Il est minuit, Docteur Schweitzer (1952). A soldier in the French Army during World War I, he returned to his career a hero. However, under the German occupation of World War II, he worked for the Franco-German film company Continental, making Henri-Georges Clouzot's Le Corbeau and other films. After the war, he was detained in prison while allegations of collaboration were investigated. After being held for six weeks, he was released as a result of a lack of evidence. Despite Fresnay's declarations that he worked in films to help save the French film industry in a period of crisis, the move damaged his popularity with the public. In 1954, he published his memoirs, Je suis comédien (Eng. I am an actor). Fresnay continued to perform regularly in film and on stage through to the 1960s. In the 1970s, he appeared in a few films for television. From then on, he lived with the French actress and singer Yvonne Printemps for the rest of his life, co-directing the Théâtre de la Michodière in Paris with her until his death in 1975. He died of respiratory problems, aged 77, on 9 January 1975, at Neuilly-sur-Seine and he is interred alongside Printemps in the local cemetery. In his autobiography (My Name Escapes Me), Alec Guinness states that Fresnay was his favourite actor. Asked how to say his name, he told The Literary Digest "I think my name is to be pronounced fray-nay. At least, it is the way I pronounce it." (Charles Earle Funk, What's the Name, Please?, Funk & Wagnalls, 1936).